Bold, graphic liner of all shades and designs were seen on the runways this Spring. While these looks may be great for the runway, they're not very practical for everyday wear. 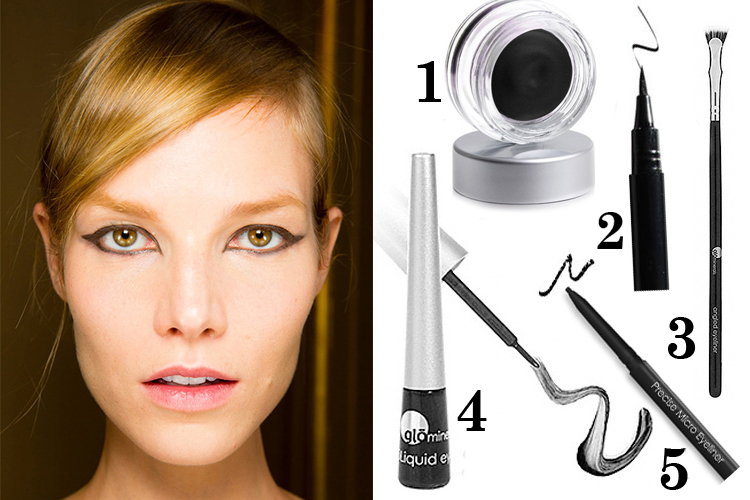 One look that kept popping up and has truly withstood the test of time is the Cat Eye. Though classic, this Spring Trend is kept fresh with varying formulas, from pencil to gel or liquid. Take it up a notch with an elongated look, or even a vibrant color. Prep your eyes for application with an eyeshadow or eyelid primer followed by tinted or translucent powder. Often this look can go awry when you try too hard to get the curve at the end. It is much easier and surprisingly works better if you simply draw a line out, following the shape of your bottom lash line. This way, you get a more precise line and don't have to keep comparing each side to the other, and adding more or taking some away to get them even. Add a little mascara and you're good to go!